The Fed’s “tapering,” the dollar’s up, bonds are down. Is this time to bet on the greenback, or to diversify out of the dollar? We believe the dollar may not only have gotten ahead of itself, it also rallied for the wrong reasons. Only the future will tell whether this is an opportunity to sell the dollar, but we can look at risks and opportunities presented. The Fed is testing the market reaction as it realizes an exit will be a major challenge and has to start somewhere preparing the markets. Manufacturing activity contracted to a four-year low in May. The Institute for Supply Management (ISM) announced Monday that its index fell in May to 49.0 from 50.7 in April, short of expectations. While recent unemployment reports showed positive headlines, U6, an unemployment measure also counting those “marginally attached to the workforce for economic reasons,” inched up in May. Instead of being on a hiring spree, employers seem to be pushing full-time employees into part-time positions as employers get ready for mandatory health insurance for full-time employees under Obamacare. More people have jobs, but they don’t earn enough to make a living. That’s not the recovery the Fed wants to see. Home prices are up. But copper and lumber prices are in deep bear market territory, suggesting that the “housing recovery” is a financially engineered one, unlikely to lead to a boom in the construction sector. Inflation expectations are down. While the Fed has a difficult time gauging just about anything in the markets these days, as it manages the entire yield curve (short-term through long-term interest rates), the gauges generally point to a cooling of inflation expectations. More so, while they are within the Fed’s general comfort zone, they are below what we believe Bernanke has in recent years been eager to see. If it’s not the economy the Fed is so excited about, maybe the Fed is concerned about asset bubbles? Ever since former Fed Chair Greenspan’s “irrational exuberance” speech in the 1990s, the Fed has been most careful about talking down asset prices. Yet, Bernanke has been rather eager to point to a higher S&P500 index as proof that QE is working. The trouble with such talk is that it raises expectations the Fed will come to the rescue when asset prices plunge. But with equity prices through the roof; with news stories on a resurgence of “house flipping” (buying & selling homes in short-order); with “cov-light loans” all the rage (loans providing little guarantees/collateral) again, a rational observer shall be excused for concern about valuations. So why not throw a little bit of cold water on the fire by encouraging chatter about a Fed exit? At the same time, the Fed printed all this money for a reason: it believes (we disagree) money printing will bring the economy back to life. And why not send up a trial balloon, to see how the markets might react if and when the tapering starts? Except that we don’t think what we are witnessing is a trial run of an unwinding at the Fed. A true unwinding may be a rather different ride; more on that below. With commodity prices under pressure, commodity currencies have had a rough time. With the Eurozone under ongoing economic pressure, the euro continues to be unloved. The yen fell out of bed with Japanese policy makers doing their share to egg on hedge funds to accelerate the currency’s demise. Investors have a difficult time envisioning how they can be bearish on the dollar when they are not positive on anything else either. We sympathize with that view with regard to at least some commodity currencies and the yen, but see value in others, most notably the euro. With regard to commodity currencies, we tend to agree that the odds are not stacked in their favor; having said that, each commodity currency has its own set of dynamics. The best thing going for the Australian dollar may well be that it has declined so much. If history is any guide, the Australian dollar should be rather weak as economic growth slows “Down Under.” Japan’s refurbished printing press is actually keeping the Australian dollar from falling more. The New Zealand Dollar next door is far better off, with its economy more exposed to soft commodities. The governor of the Reserve Bank of New Zealand has expressed an interest to join the “currency wars,” talking down the kiwi. With little success, though as the New Zealand dollar, while relatively strong for the right reasons, is not cheap. The South African rand and Brazilian real have domestic issues that make us stay away from these currencies. The one bright spot we see in that space is the Canadian dollar. The Bank of Canada is now freed of Mark Carney, who may now be trash-talking the British pound sterling. 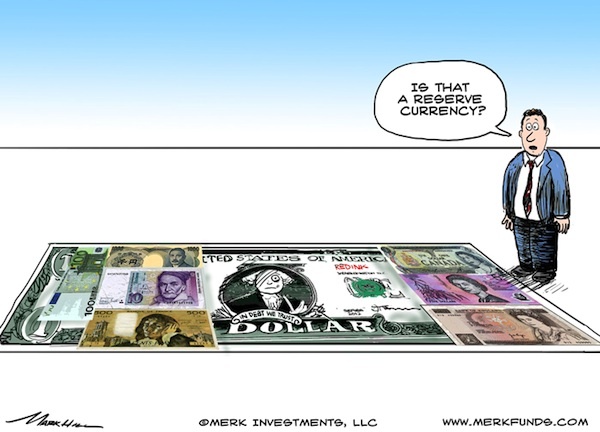 We believe that, on a relative basis, the Canadian dollar is cheap. The yen is a bit of a different story, possibly taking a breather from the rather radical policies to jump-start the ailing Japanese economy. Just because the Japanese yen has been strengthening for a few days doesn’t mean Japan is out of the woods. Indeed, the canary in Japan’s coalmine are Japanese Government Bonds (JGBs). We don’t see how Japan can finance itself in the medium term, especially not if Abenomics is successful. The Bank of Japan may cap the borrowing cost at some point by buying unlimited amounts of JGBs; the yen may not survive Abenomics. Japan may be proof that we never had a Eurozone crisis, but that we have a global crisis. Unlike what pundits want to make us believe, economic growth may not be good for the U.S. dollar. That’s because the bond market may turn into bear market territory; given that foreigners buy a lot of Treasuries, this may not bode well for the U.S. dollar. Historically, it’s only in the late phases of a tightening cycle that the dollar may benefit as the next bull market in Treasuries is anticipated. We don’t think the current cycle has much precedent in history, but it is something to keep in mind. We believe the biggest threat to the dollar might indeed be economic growth. That’s because economic growth might unleash a flood out of the bond market. We are not even talking about China dumping its Treasuries, but historic levels of volatility returning to the space, scaring momentum players and yield chasers alike. Aside from a general uptick in volatility, challenges in the bond market may put the spotlight onto an unsustainable U.S. government deficit. Without entitlement reform, the tailwinds produced by more domestic energy production won’t make up for the challenges ahead. And it’s not about the numbers; it’s about the perception of the sustainability. Instead of trying to time a change in sentiment, investors may want to take precautions when they acknowledge the risks. We don’t have the cleanest dirty shirt; the U.S. shirt is dirty, but we feel good wearing it. Last year, by the way, that very “clean” U.S. shirt sent the dollar down about 1.7% versus the euro; as of this writing, the greenback is up 0.8% year-to-date versus the euro. Stocks are up. Bonds are expensive. Dollar cash is unlikely to preserve purchasing power in an environment of negative real rates. Diversifying to a basket of hard currencies might help to mitigate some of the risks out there. It clearly adds currency risk. But in an environment where there may not be such a thing as a risk free asset, it might be a risk worth pursuing. So far this year, investors lost money diversifying out of the dollar. But isn’t that partly what one should be willing to accept when the stock market goes through the roof? True diversification feels better when markets (i.e., equity markets) turn down rather than when they march higher, which may be forgotten in the current environment of bullishness. As the “Oracle of Omaha” has pointed out, it may be better to be fearful when others are greedy. To learn more, please join us for a webinar: click to join our webinar list; our next Webinar is Tuesday, June 18. Also don’t miss another Merk Insight by signing up for our newsletter.